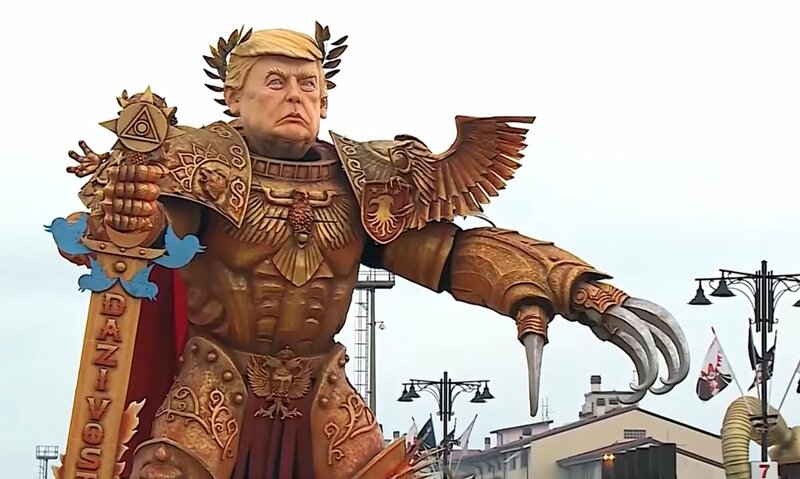 Complete with a huge 'tweet-dashing' sword and 'golden' armor, a colossal float depicted US President Donald Trump as the grandiose Emperor from the Warhammer 40,000 series. In all his might and glory, His Majesty the Emperor of Mankind descended on the small town of Viareggio in central Italy on Saturday. As part of an annual carnival procession, US President Donald Trump 'appeared' cosplaying the iconic character from the Warhammer 40,000 universe. The popular franchise of tabletops, which also spurred several video games, typically depicts the Emperor as a walking epitome of epicness and unparalleled power. The colossal float of Trump conveyed the same message. Clad in shiny golden armor, he sported a grim, yet pompous and regal look in his eyes. In his hand he wielded a huge broadsword. The phrase 'your duties' in Italian, engraved on the blade, hinted that he slays his enemies as boldly as he slaps tariffs on EU goods. The weapon’s hilt was fitted with blue Twitter birds, apparently suggesting that the US president pulls no punches while attacking opponents on social media. A human-sized ‘Trump’ was also seen marching ahead on the giant float, dressed as one of the Space Marines, the Emperor’s loyal troops. The striking float left some commenters questioning whether it was meant to ridicule Trump or compliment him. @GovMikeSheridan God Emperor! Twitter is his Sword. "Trump unveils his 2020 platform," one person wrote.